Add your site URL in the space provided (see below). After entering your URL, click on Add Site. Click on View Details and Downloads. You can copy the License Key of your purchased theme there. • From your WordPress Dashboard, go to Appearance > Theme License. • Paste the License Key in the specified area. You are now set up to receive automatic updates of your theme. Having some trouble with the Theme License link under Appearance. There is not a Theme License link. Any suggestions? i am having the same problem. and i paid for this theme and it shows status pending? yes please contact our support directly. I figured it out. I was using a Mac with Safari. Safari would not properly save the .zip file. By using Firefox, the download saved properly under the .zip file. This allowed me to upload the downloaded .zip file. From the time selection page. By uploading a downloaded .zip file from Firefox I was able to use the theme. Ask any questions. Yes some browsers are really smart and uses auto extractor. So, you did right thing. Either you other browser or you can just zip the folder that you got auto extracted. I just bought the theme Photo Perfect Pro but I do not put the license key in my WordPress . Theme License section does not appear in the Appearance menu . So I do not know what to do because I have to pay this theme . Sorry for the late reply @beezco. It seems like you are using old version where this menu section would not work. Please confirm you have the latest theme installed or any updates available for download in your dashboard. Or can you please write here your current theme version so that we can verify it? I am using BizlightVersion: 1.0.6. It doesn’t have the theme license in the menu….please help. Hello @stacy, are you using its premium version ‘Bizlight Pro’ . Premium version has this license input field. The current updated version is 2.0.6 . Please verify once and let us know if this is still an issue. I bought Photo Perfect Pro. Hello @mujeebart, can you please let us know the current version you have downloaded ? current i am using Version 4.4.2. Sorry for the confusion, but would like to know the current version of the Photo Perfect Pro theme that you have installed. You can find the current version in readme.txt file inside your theme directory. I don’t have an option to download the license. I have the free version 1.4. Please advise. @sohughes1, sorry free version does not have this option and feature available. You have to go for Pro version of the theme you are currently using. Or if you have already purchased the Pro version please install and activate to get this option enabled. You can find your license key in your account dashboard at Theme Palace. You need to copy and paste it in ‘Theme License’ input field in your WP admin dashboard. Further, be informed that the product license key is unique per domain or site. For more details, read our FAQs . Today I bought education hub theme. I tried activating it on my website. I dont find Licenses key under appearance. I am using wordpress 4.5.2 (latest one). Whats going on ? Make sure you have activated the purchased theme and deactivate the free theme if previously activated. After activating the pro theme, you should see the Theme License menu. Hi Team! Thumbs up on the theme great work I have just bought the Travel Eye theme for my online travel business Just wanted to know how do i make the menu stay on top when I scroll through the page? your response would be much appreciated. Also I will need someone to work on a more complex form pulling data from a 3rd party API via XML do you know if this will be an issue, and also does your company do something like this? Does this theme have an expiration? That was not stated when purchased. Yes, the license key you obtain with a purchase has 1 year validity. For more details, please read FAQs here. The initial images in masonry layout is the post’s featured images. So to set the initial images in masonry layout first you need to create/add post going to Admin Panel / Posts -> Add New. While creating post you need to set Featured Image ( You will see Featured Image section little below in right hand side of the screen) for that post will will be displayed as images in masonry layout. Similarly you can create/add more posts with featured image which will be displayed as images in masonry layout. If you have two post’s with featured image then you will see two images in masonry layout. Please post in your further queries in our support forum to get swift responses. @niharikabalachandra, could you please let us know for what purpose you are trying to change / add your site URL there. We usually do not recommend this approach. Normally, this information is auto updated after you install and activate your license key from the site. Also if you want to use the license key in another site domain, you would just deactivate / remove the previous license and use it in another new domain as license would normally work back again from there. I have activated the license on word press, will I now receive updates to my theme? Yes, once you input the license key and activate it successfully, you will be able to receive the automatic updates. Hi. I’ve been trying to activate my theme’s license to ensure I receive the automatic updates (Theme is Education Hub). I am trying Account > View Licenses > Manage Sites but the View Licenses link is not working for me. Can you suggest what I might be doing wrong?! Well you can go to your account dashboard and view your purchase history. Click on ‘View details and downloads’ link which will show you other information along with the License Key. Copy this license key and go to your dashboard Appearance -> Theme License , input the license and activate it. It should normally work now. Let us know if you have any confusions. Na code krijg ik License status is unknown. You need to once talk to your hosting. Some hosting blocks API call method which means your hosting server is unable to authenticate with Theme Palace server for Key validation. If still problem persists, please fill out this form http://themepalace.com/update-key-support/ and let our support team inspect your setup. hi,i just bought Expedition Pro . i follow the instruction to activate my theme on my wordpress but it not work . i go to my acct & select View License but it is no work , i mean cannot point to manage site . i can’t do the following step . i try to download zip file & upload to theme , it failed . the msg show”the uploaded file exceeds the upload_max_filesize directivein php.ini. Please help !!! Why ? Can you guide me ? i tried to activate the licenses . when i want try to re-summit again , i cannot view license to manage site again ..it seem sometime can work and sometime not work? i don’t know what is going on? i still cannot install the theme which i purchase , can you please install for me ! It seems like you still have ‘free’ version activated in your site. Make sure you upload the purchased premium version from dashboard/cPanel/FTP and activate the newer version. 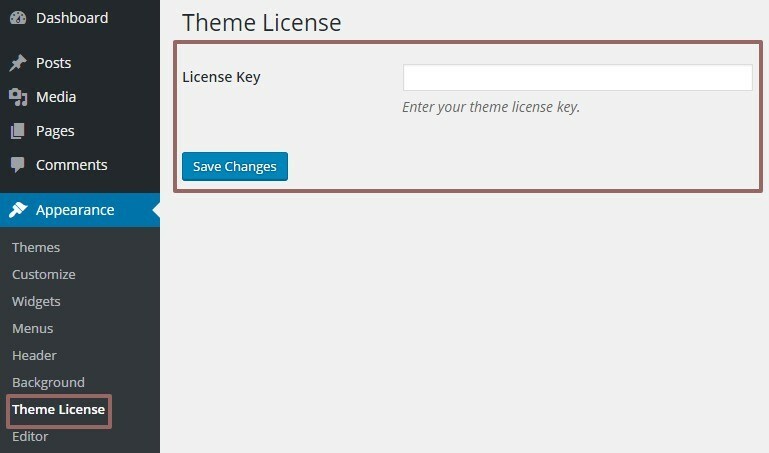 Then you will see the License option under Appearance -> Theme License. If you have make sure with all above condition satisfied, then email your WP login detail to support[at]wensolutions.com for further inspection. Hi today i updates word press new version , finally i can activate the licensee for Expedition Pro but it seem home / front main slider, popular trip.. all not work , cannot show up on my home page . i use before the demo version . it is work ! 3. If neither of these work, it’s time to ask your hosting provider to increase the maximum file and post sizes on your account. Keep in mind that most decent hosting providers allow this, and If your hosting provider won’t accommodate you, perhaps it’s time to find a new hosting provider. hi , I try back to Demo version . it is work good but Expedition Pro cannot work …..!!!!! please guide me urgent ! Our support member will provide you further assistance on your issues. I’ve been using Clean Corporate and just purchased the upgraded Clean Corporate Pro. How do I activate the Pro version and will I lose what I’ve been working on already in the free version. @sfennell, you can simply upload the zip of pro version from Themes section of the dashboard and activate it. No, you won’t loose any settings after upgrading to the premium version. so that our support member picks your problem and guide you on your problems. Issue on which theme is not clear. For the particular issue reporting, you can kindly reach to our support forum and post in your issue there. Our support member would assist you verify this issue and provide you the possible solution. May I know any Alternative of this ??? There is no alternative option to input the license except the one describe above in the article.